The sun is beginning to shine, daffodils are braving the elements, and children and parents both are beginning to long for the sweet, beautiful days that spring brings. And while I can’t banish the rain or the chill, I can share some simple, constructive, delightful activities that your family will enjoy doing together over the next few weeks. There is nothing more sweet than shared laughter and joy over scissors and glue! Children are always looking for a gift that they can hand craft for Mom or anyone else in the family, for that matter! Personalized stationery definitely fits the bill. Monogram storebought cards or stationery with initials. Tear the edge of cards for a fun finish! Use simple stamps or shapes (heart, cross, flower, bird) for a clean, beautiful card. 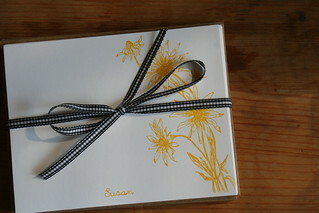 Cut and fold cards from decorative paper in Mom’s favorite colors. Tie your stack with a ribbon and be sure to write a message in one of the cards! This simple science experiment will make a huge impact! It memorably demonstrates a model of cloud formation and is fun to boot. Cut the neck of a clear, plastic 2-liter soft drink bottle so the opening is about 2 inches wide. Carefully pour hot water into the bottle until the bottle is about one-fifth full. Quickly place over the opening a plastic sandwich bag containing 4-6 ice cubes. Ask, “What changes occur in the bottle? How does this model relate to cloud formation in the atmosphere? 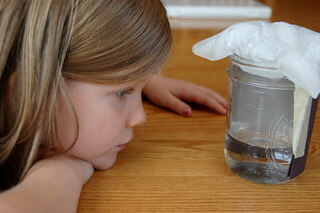 On the basis of this experiment and their own experience, have your children draw a diagram of the water cycle. Did you know you could make homemade window clings using only glue, food coloring, and dish soap? These clever creations are adorable! Click here to read the full instructions. Last but not least, even with all the flowers outside, sometimes you just need a bouquet of long-lasting ones inside. These tissue paper flowers are quick, but some of the most beautiful that I have ever seen! Now pull out those scissors and glue, gather the family, and enjoy the memories! “Custom Gocco Screenprinted Stationery,” © 2007 Sarah Parrott, used under a Creative Commons Attribution-Noncommercial license: http://creativecommons.org/licenses/by-nc/3.0/. “Sweater Heart,” © 20012 Your Secret Admiral, used under a Creative Commons Attribution-Noncommercial license: http://creativecommons.org/licenses/by-nc/3.0/. “Kindergarten Science- Weather,” © 2012 Duo de Hale, used under a Creative Commons Attribution-Noncommercial license: http://creativecommons.org/licenses/by-nc/3.0/.